Peterborough United have come up with another plan to benefit their supporters. Following close on the heels of reduced admission for the Good Friday game against Fleetwood and a discount scheme for season-ticket holders, the club have today (April 13) announced news of a referral scheme that can actually earn their fans some cash. Fans who introduce a friend to the club can pocket the following cash rewards if that friend becomes a season-ticket holder for the 2017-2018 campaign. 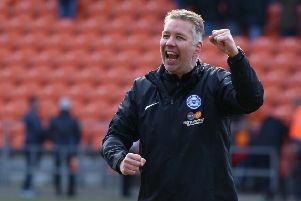 To refer a friend, either email tickets@theposh.com, visit the ABAX Stadium Box Office or call the Posh Ticket Office on 01733 865674 (option 2) with the NAME and CONTACT DETAILS of the fan you are referring. Should they then complete the purchase of a season ticket, you will be rewarded with the cash amount above (where applicable for every season ticket purchased by your friend). Season tickets bought under this scheme are non-refundable. Rewards will be issued following cleared payment of the season tickets bought. Rewards apply to season tickets bought on or after the 13th April 2017. Purchaser can be a season ticket holder previously including 2016/17 season. Purchaser must live at a different address to the referrer.